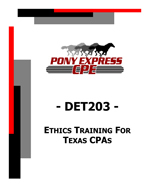 This is an ethics course for Texas CPAs covering standards of professional conduct and business practices adhered to in order to enhance their profession and maximize idealism, justice and fairness when dealing with the public, clients and other members of their profession. It provides a background on ethical principles and values, ethical codes and requirements included in the AICPA Code of Professional Conduct, and a focus on the Texas State Board of Public Accountancy Rules of Professional Conduct. It also presents an approach to coping with ethical dilemmas, the Sarbanes-Oxley Act and its impact on business ethics, new internal control requirements, and the responsibilities for Texas CPA’s. The rules will be supplemented with case studies and enforcement actions that the Board has taken. The intention is to provide you with precise text from the Board, along with supplemental information to help understand real-life situations or nuances.